Whether it's for yourself or a gift for a loved one, this is a piece that can be added to on every special ocassion with a beautiful new bead charm. As more bead charms are collected each year, the bracelet will tell a story of landmark events and personal milestones in the most beautiful and unique way. 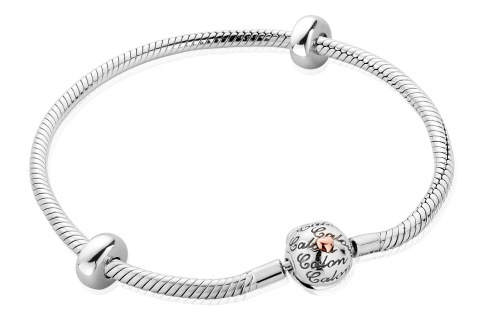 Featuring a distinct fastening that has been inscribed with the word Calon (Welsh for "heart"), this beautifully handcrafted sterling silver bracelet has a rose heart at its centre containing rare Welsh gold. Item purchased as a present and the design and quality absolutely beautiful. Little difficult to locate fastening at first but once found apparently simple to operate. The smile on the face of the recipient said it all and the sentiment of calon lan describes her to a tee. Thank you for producing such a beautiful quality item. Bought this bracelet and other charms as a gift for my wife on our wedding day. Service and products are fantastic, we are looking forward to buying more milestone charms as we enjoy our married life together. Diolch yn fawr. Lisa loved it almost as much as our Newborn daughter! Wanted to get a piece of clogau for my Fiance as a present for the birth of our second Daughter, Lisa had seen the bracelet in the catalogue from a previous purchase. I ordered on the Wednesday and it came on the Thursday! ( As I ordered 2 charms with it ) needless to say Lisa loved it almost as much as our Newborn daughter! Thank you so much, customer services are always excellent. A simple stylish bracelet which is a worthy addition to my wifes collection, she loved it. It is a plus that it was offered in 21cm option.